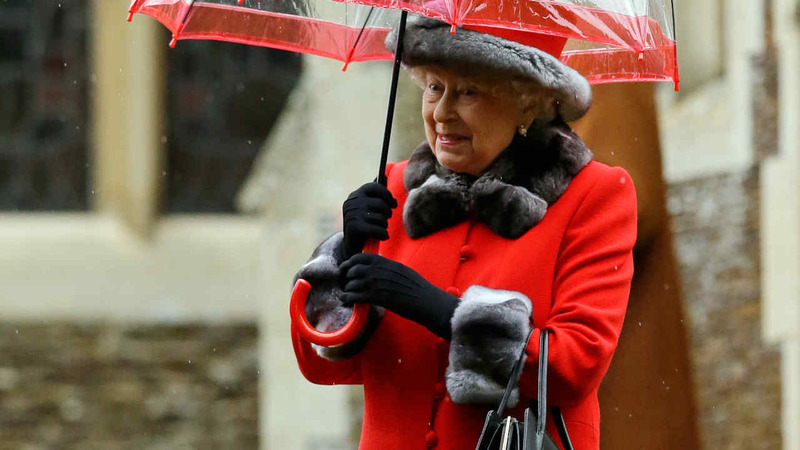 SANDRINGHAM, England -- In a festive red coat, Queen Elizabeth II led the royal family to a traditional Christmas Day church service Friday, but young Prince George and his baby sister Princess Charlotte stayed home amid the sprinkles of rain. Prince Charles and his wife Camilla were among the royals attending the service at St. Mary Magdalene Church on the Sandringham estate as some 1,000 well-wishers marked the festivities, which included the National Anthem and several hymns. Prince William and his wife Kate came as well, but they left George, 2, and 7-month-old Charlotte at home. Kate wore a green coat and hat and chatted with brother-in-law Prince Harry. The queen will use her Christmas broadcast Friday afternoon to emphasize that light can triumph over darkness after a difficult year. The queen will note there have been "moments of darkness" in the last year, which has been marked by extremist attacks and a migrant crisis that has overwhelmed Europe, but cites the Bible as offering solace. "The Gospel of John contains a verse of great hope, often read at Christmas carol services: 'The light shines in the darkness, and the darkness has not overcome it,'" the queen plans to say, according to excerpts released by Buckingham Palace. The prerecorded speech - a longstanding Christmas tradition - will be broadcast on radio and television in Britain at 3 p.m. (1500 GMT, 10 a.m. EST) and in many parts of the British Commonwealth on Christmas Day. It will also be posted on the royal YouTube channel. The queen, her husband Prince Philip and senior members of the royal family plan to spend most of the day at her sprawling Sandringham estate in Norfolk, 110 miles (175 kilometers) north of London. There is usually a gala Christmas lunch for the royals after church, followed by a walk outside.